Walking Dead Live Thread. Caution: Spoilers Abound! This season is GOOD so far, yes? We've been getting more character development than in seasons past; a better exploration of actual life, post-apocalypse. So, there are questions. Will Rick expose Carol? 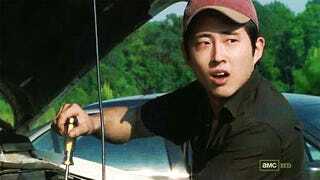 Will Glenn make it? Will Daryl give anyone else fleas? WILL SOMEONE PLEASE BURN CARL'S HAT ALREADY? ?